Enjoy unfettered access to Ka'anapali Beach. While mom and dad sip a Mai Tai poolside, treat the kids to some Hawaiian-style POG. Recently updated, all condos feature a full kitchen with granite countertops and modern bathrooms. Take a short walk with the family to the local shopping area nearby to enjoy this island treat. You're right on Ka'anapali Beach with ocean views throughout the resort. The pristine lawn is interspersed with jungle streams and native trees. Aston Kaanapali Shores combines Hawaiian-style rental condos with a laid-back resort atmosphere. 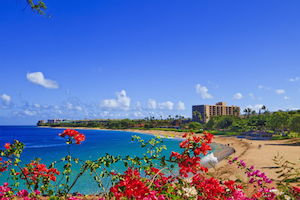 The beachfront resort offers easy access to arguably the nicest stretch of sand in the world - Kaanapali Beach - the resort features beautiful grounds with lush tropical gardens. You’ll have two pools to choose from: an ocean pool and a garden pool. Go for a swim, or grab a refreshing drink from the poolside bar and relax in a lounge chair. When it’s time for lunch, have a family cookout on the bbq grills, or dine at the on-site restaurant, the Beach Club Restaurant and Bar. Kids aged five through twelve will have a blast at the on-site children’s day camp, Camp Kaanapali. Reservations must be made twenty-four hours in advance to ensure that your child can enjoy the arts and crafts, nature walks, games, hula dancing, scavenger hunts, lei making and other fun activities. While the kids are occupied at day camp, visit the tennis courts and get in touch with your inner athlete. Air-conditioned studio, one- and two-bedroom condos sleep six to seven guests. Make a shopping list and head across the street to the Times Supermarket to stock your full kitchen. There’s no shortage of in-suite entertainment at Aston Kaanapali Shores. Flat screen TVs have cable, perfect for watching the latest episode of your favorite show. Challenge the kids to a game on the PlayStation 3. It also plays BluRays, so pack a few favorites from home to watch. Gather everyone on the couch with a selection of snacks and get ready for a fun family movie night. One- and two-bedroom condos have in-suite washer/dryers, allowing you to pack light. The resort provides a complimentary trolley from your rental to Whalers Village and Lahaina. Whalers Village is an outdoor shopping mall that features a variety of shops and restaurants. Pick up a new swimsuit at PacSun or Billabong. For apparel, there’s Quicksilver and Tommy Bahama. Lululemon is well-known for their activewear. Treat yourself to a new piece of jewelry at Alex and Ani, Maui Divers or Pandora or a handbag from Louis Vuitton or Kate Spade. Hungry? Try Hula Grill, Nikki’s Pizza or Leilani’s on the Beach. Stop by Yogurtland or Häagen-Dazs for dessert. Up for a round of golf? Visit Royal Kaanapali Golf Course. This eighteen-hole, par seventy-one course was designed by Robert Trent Jones Senior in 1962. The course underwent a thirteen-million-dollar renovation between 2006 and 2007. Royal Kaanapali has hosted many golf legends including Arnold Palmer, Nancy Lopez, and Billy Casper.